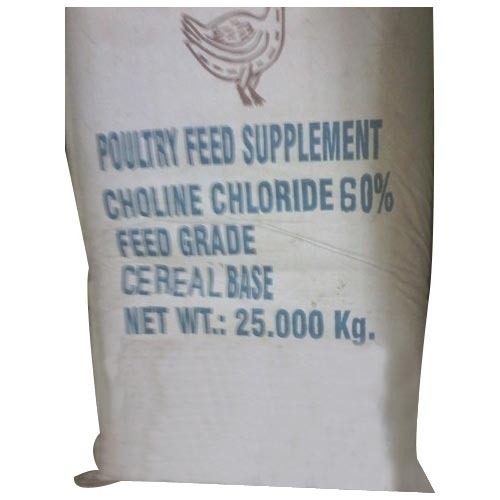 We are very well known for offering Choline Chloride to our key clients. Choline and chloride are the two different components used to formulate this chemical. These are available in different specifications to suit the requirements of the chemical industry and laboratories. Moreover, these can be availed from us at market leading prices. Vested in the year 1992, Chandresh Agency is a Sole Proprietorship firm with a strong foothold in industry with a growing customer base. Operating its business from its head office situated in the city Kolkata, West Bengal (India), company is engaged in the business of feed supplements and pharmaceutical products. We are the renowned wholesaler, trader, dealer and supplier of Amino Acid, Neomycin Sulfate, Vitamin Powder, Chemical Powder and many more. We as a company have a vision to provide the best and remain a preferred choice in the industry. We are in the market from more than a decade and had delivered our best with maximum customer satisfaction. Over a period of time we have gained confidence of our customers and remained a known name in the industry. We make sure that the end products we deliver are of the best quality and fines raw material is used for the same.